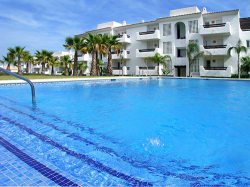 VILLAS AND APARTMENTS TO RENT IN SAN PEDRO, SPAIN. Welcome to our selection of holiday homes to rent in San Pedro, Spain. Ideally located in the heart of the Costa del Sol, the small coastal town of San Pedro is close to some of the biggest resorts in the region � yet is only a few minutes drive away from the peace and solitude of the Sierra de Ronda mountain range. The town used to be little more than a farmers� village, and the old town has not changed much in decades, but the new developments along the seafront mean that tourists have all the amenities, such as bars, restaurants and activities, that they could possibly want on holiday. The narrow streets of San Pedro are great for exploring when the sun is at its hottest; full of small local shops and cafes, the main square with its church is the perfect place to relax and people-watch with a cool drink! The weekly street market takes place in the old town every Thursday where you can buy local crafts and souvenirs, as well as fresh produce if you are self catering. Walking from the old town towards the sea, you will come to the wide promenade which stretches along the length of the San Pedro beaches. This promenade is busy day and night, as are the beach bars that line the walkway. One of the most popular, though also most expensive, is the rather exclusive Bora Bora. Buy yourself a drink and make it last as you relax on their comfortable sofas and enjoy the view of the Mediterranean. Just outside of San Pedro there are two fascinating historical buildings that are worth a visit, both within reasonable walking distance. An ancient church can be found in the woods next to the main beach in San Pedro, while a few kilometres towards Guadalmina, you can visit the third century Roman baths. If San Pedro is the base for your Costa del Sol holiday, then you have certainly picked a great location. Marbella, one of the glitziest and most glamorous resorts in all of Europe is only a short drive away. Perfect for window shopping or even getting dressed up and going for a night on the town. The larger town of Estepona is also close by, which has more tourism amenities such as sports facilities, children�s play parks and even the Selwo Aventura Safari Park, which younger kids will love. Adults may prefer to get away from the coast and drive up into the mountains, where you can visit typically Spanish villages or head off the beaten track on one of the many walking or biking trails that criss-cross this part of the countryside. Many trails will take you high into the mountains, where you can enjoy spectacular views over the Costa del Sol and the Mediterranean. Looking for self catering holiday accommodation in San Pedro? Then below is a selection of holiday villas in San Pedro and holiday apartments in San Pedro that can be rented direct from their owners. You can either click on each listing for further details or you can use our search engine on the left if you are looking for something in particular. San Pedro has some of the best golf courses in the world to offer a golfers paradise to anyone who enjoys a good game. Why not take a swing at the professional Guadalmina Golf Course or try out one of the two beachside golf courses that this town offers. There is a range of different diving activities that you may want to be involved with. There is a scuba diving beginner�s class for those who may have never dived before. There are a variety of dive sights to view such as underwater caves and sunken wreckages. Night dives are also available for those interested. There are a variety of boating trips on offer in San Pedro. This brings a world of activities such as cruises, fishing trips, or even have a picnic just of the lovely coast. San Pedro is located right in the centre of Costa del Sol. Near to some of the biggest resorts in the region, but yet, just a short drive to escape to the peace and quiet of the Sierra de Ronda mountain range. The town�s main source of income was once farming, and has still remained the same over the years except for improvements for tourism, which includes bars, clubs and restaurants. San Pedro is known not for its nightlife, but for nights spent walking up the promenade and its fine restaurants.